There’s a lot of interest in the 30 Crossing project. See the information regarding some of the project's frequently asked questions. Can’t find what you’re looking for? Contact us and let us know how we can help. When is construction estimated to start? Construction is estimated to begin in late 2019 or early 2020. In January 2019, the Arkansas State Highway Commission approved selection of Kiewit Massman Construction to provide design and construction of the 30 Crossing project, upon the successful conclusion of an optimization and refinement period. Kiewit Massman Construction was one of six design-build teams to respond to the 30 Crossing Request for Qualifications in June 2017. After respondents were short-listed, the Request for Proposals was released in September 2018. Two short-listed teams provided proposals in December 2018. After evaluating the proposals, which included design, construction methods, third-party coordination, and an optimization and refinement plan, ARDOT moved forward into a design-build agreement with Kiewit Massman Construction. The team includes lead designer Burns & McDonnell Engineering and lead quality assurance firm Volkert. The optimization and refinement period is a six-month period in which ARDOT and Kiewit Massman Construction will work together to define the 30 Crossing project scope that can be completed within the available funding. Lane closures will be necessary during construction to allow for the safe and efficient implementation of the project. Partial closures are expected throughout the project during off-peak hours. During periods of peak travel, the goal will be to maintain two to three lanes of travel in the peak direction, as much as possible. Full closures along portions of the corridor may be necessary but will be short-term in duration. The frequency of occurrence of full closures will be minimized to the extent possible. The public will be notified of these closures in advance through news releases and variable message signs. Possible nearby detour routes within the project area will be suggested so that the public can avoid congestion potentially resulting from the lane closures. Ramp closures and closure of more than one cross street or frontage road intersection at the same time will also be minimized. What is the 30 Crossing project? The 30 Crossing project consists of reconstructing the existing six-lane (three in each direction) roadway while adding two decision lanes in each direction that ultimately feed into the collector/distributor (C/D) lanes located at the I-30 Arkansas River Bridge. A split-diamond interchange will be used to distribute traffic onto the downtown road network. Identified by the local MPO as the locally Preferred Alternative and has received the most public and business support. The first phase of the 30 Crossing project will be delivered using the Design-Build to a Budget delivery method. This method will maximize the amount of project scope that can be delivered under the existing available funding of $631.7 million. The remaining scope of the 30 Crossing project will be delivered under future projects as funding becomes available. What is the Split Diamond Interchange? East 4th Street between Cumberland Street and the southbound frontage road would be two lanes eastbound and one lane westbound, requiring the removal of 29 on-street parking spaces to accommodate three lanes of traffic. A Texas U-turn would be added to allow traffic on the southbound I-30 off-ramp to exit onto 3rd Street. Mahlon Martin Street would be widened and converted from a one-way roadway to a two-way roadway. East 2nd Street would be widened and improved between Cumberland Street and Mahlon Martin Street to provide two lanes eastbound and two lanes westbound. Six on-street parking spaces along East 2nd Street and twelve along Ferry Street would be removed. A new road would be constructed between East 3rd and East 4th Streets east of I-30. Cumberland Street between East 2nd Street and East 3rd Street would be slightly widened to provide two lanes in both the northbound and southbound directions. Traffic signals may be required at the intersections of East 2nd Street with River Market Avenue, Sherman Street, and Mahlon Martin Street; East 3rd Street with River Market Avenue, the Texas U-turn and Mahlon Martin Street; East 4th Street with River Market Avenue and Rock Street; and Capitol Avenue and the southbound frontage road. The Split Diamond Interchange removes the existing exit ramp that provides direct access to the complex intersection of Hwy. 10, 2nd Street and Cumberland Street, which provides opportunity for a decrease in traffic at this intersection. The traffic currently using the existing Hwy. 10 interchange will shift primarily to East 2nd Street, East 3rd Street, and East 4th Street, resulting in an increase in the traffic volumes on these city streets. The removal of the existing interchange opens up the space currently occupied by the interchange, providing opportunity for improved multi-modal east-west movement under I-30 at this location. Does the project include major improvements to I-630? The 30 Crossing project includes improvements to I-30 and I-40; it does not include major improvements to I-630. Traffic modeling determined that additional improvements on I-630 from Louisiana Street west beyond the Planning and Environmental Linkage (PEL) study limits (“outside area”) may be needed in the future year (2041) to avoid backups from congestion outside the study limits impacting traffic and safety inside the study limits on I-30. ARDOT has acknowledged this outside area warrants additional study and will evaluate and potentially improve, as determined necessary. What is the purpose of the 30 Crossing project? The purpose of this project is to increase the safety of vehicular traffic on I-30 and I-40 by correcting geometric deficiencies, improve the condition of the roadway by modernizing infrastructure and maintaining a state of good repair, improve navigational safety on the Arkansas River, correct the I-30 Arkansas River Bridge deficiencies, and reduce traffic congestion by improving mobility on I-30 and I-40. The intent of the project improvements is to provide a reliable transportation corridor between Little Rock and North Little Rock that is structurally sound and improves safety and mobility by improving the operations of the multiple interchanges in the corridor. The I-30 Arkansas River Bridge will be replaced with a new structure, correcting the functional and structural deficiencies and navigation safety issues. The close proximity of five high-volume interchanges (Hwy 67/I-40, I-40/I-30, I-30/Broadway, I-30/Hwy. 10, and I-30/I-630) and a major river crossing in the 30 Crossing corridor introduces a complex interdependence between each of these major transportation components. Due to this interdependence, improvements to the geometric and structural deficiencies of any one component relates directly to the other components in close proximity to it. Although the Arkansas River Bridge is the most critical component of the 30 Crossing project, corrections to its structural and geometric deficiencies tie directly into the improvements of the components adjacent to it. The major geometric deficiency for all of the interchanges and the River Bridge is insufficient space and distance necessary to safely perform the merging and weaving maneuvers that are typical when traveling through and beyond a major interchange. The result of the similar deficiencies and close proximity of each interdependent component is that operational improvements for each component blend into those adjacent to it resulting in an increase of capacity throughout the project. How is transit a part of the project? Two of the goals established for the 30 Crossing project included connecting bicycle/pedestrian friendly facilities across I-30/I-40 and accommodating existing transit and future transit. Pedestrian facilities are well developed in the project area, with the two closest bridges to Arkansas River Bridge being pedestrian/bike-only bridges. There is also a network of bicycle facilities, including the Arkansas River Trail, which crosses the corridor along both sides of the Arkansas River. There is one bus route run by a public transit system (Rock Region Metro, formerly Central Arkansas Transit Authority, or CATA) that uses the corridor, with five trips per day. Additionally, the River Rail Street Car runs throughout the downtown areas of Little Rock and North Little Rock, including under the existing I-30 bridge over 3rd Street. The proposed Action Alternatives were developed to avoid impacts to the River Rail Street Car as much as possible. Does the project take into account bicycle and pedestrian facilities? Proposed bicycle and pedestrian facilities are included in the project. These accommodations include wider sidewalks for pedestrians and wider lanes to accommodate a four-foot-wide bike lane in each direction for cyclists at the 6th St. and 9th St. bridges over I-30. In addition, underpass bridge improvements could include sidewalk improvements and lighting for travelers at most of the cross streets which have bridge openings that meet or exceed the master street plan width. The striping for a designated bike lane would be determined by the cities; however, the project would provide the lane widths to accommodate a four-foot-wide bike lane in each direction. These cross-street improvements are a result of community input and provided in an effort to improve east to west connectivity for neighborhoods adjacent to the proposed project limits. Additional sidewalks are also included for the reconstruction of 2nd Street, to include sidewalks along both sides of 2nd Street, two westbound lanes, and two eastbound lanes from Cumberland Street to Mahlon Martin Street. The sidewalks would provide additional east-to-west connectivity. What are the project's aesthetic impacts? The viewshed from the 30 Crossing project area is described in the Visual Impact Assessment Technical Report (Appendix K) of the Environmental Assessment. From south to north, the Area of Visual Effect (AVE) was broken down into the Landscape Units of North Little Rock, I-30 Arkansas River Bridge, and Little Rock. The North Little Rock Landscape Unit consists of the wetland area of Dark Hollow Basin, Northern Residential area, and Southern Light Industrial area. The I-30 Bridge (Arkansas River) Landscape Unit consists of the North Bank, Arkansas River, Clinton Presidential Center and Park, and downtown Little Rock. 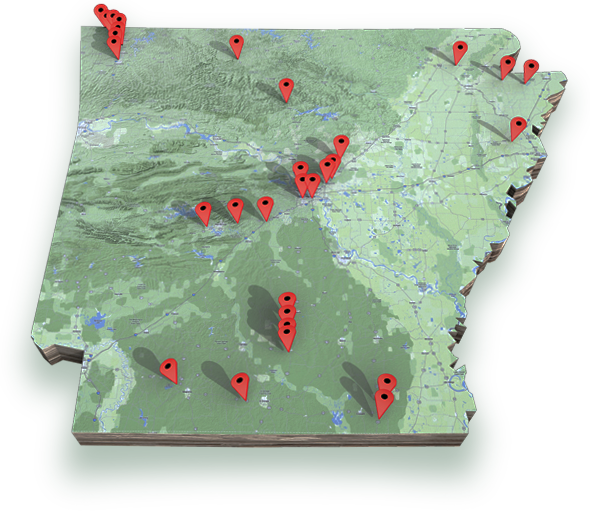 The Little Rock Landscape Unit consists of the predominantly residential area of South Little Rock, the light industrial/commercial area of East Little Rock, MacArthur Park, and the natural area of Fourche Creek. Once construction has been completed, the 30 Crossing project would provide an area of revitalized green space in downtown Little Rock. It removes the existing Hwy. 10 Interchange and elevated spur from I-30 to Cumberland Street, enhancing the viewshed in downtown Little Rock and providing 15.7 acres of green space. The project includes improvements within the ROW, with very little alteration in the height of the roadway and bridges above the surrounding land. Consequently, changes in the appearance of the corridor, as well as the views experienced by road users, would be minor. The Cities of Little Rock and North Little Rock will provide guidance on the aesthetics for their respective portions of the project in an Agreement of Understanding with ARDOT. Aesthetic components that are not addressed in these Agreements will be implemented in accordance with the Project Aesthetics Guidelines which were developed with input from a visioning committee of citizens from Little Rock, North Little Rock, and Pulaski County. Will there be impacts to downtown parking? The existing public parking lots within ARDOT right of way will be removed 1) under the I-30 facility south of President Clinton Ave. 2) within the circular ramp to 2nd St./Ferry Street. and 3) under the Markham St./Hwy. 10 (Cantrell Rd.) ramp to Cumberland Avenue. Removal of these parking lots are not required for the proposed improvements; however, the City of Little Rock has not requested to renew the air space agreement with ARDOT to retain these parking facilities. These areas could potentially be replaced by the proposed roadway improvements or additional green space to be determined at a later date as a separate project by the City of Little Rock. On-street parking options are available and business owners would need to consider the parking options for their customers and employees. The green space could also include bike and pedestrian walkways to provide additional east-west connectivity. The green space is further discussed in the EA Appendix F: Community Impacts Technical Report. Modifications to 2nd Street and 4th Street would result in additional parking removals. On-street parking removals are anticipated along 2nd Street, 4th Street, and Ferry Street. On-street parking removal would be required along these streets to accommodate additional lanes for 2nd Street and 4th Street. Removal of these parking options could influence future development along these streets and require future consideration of parking options for future developments. The 30 Crossing project is part of the Connecting Arkansas Program (CAP) and is funded with both federal and state funds based upon a $631.7 million-dollar budget. The federal funds are National Highway Performance Program (NHPP) funds making up approximately 29% of the budget. The state funds consist of match funds for federal funding (approximately 7% of the budget) and CAP funds (approximately 64% of the budget). The 30 Crossing corridor consists of infrastructure that is over 50 years old and at the end of its useful life, including the Arkansas River Bridge which has been classified as functionally obsolete, structurally deficient, and fracture critical in its design. In addition to these infrastructure deficiencies, congestion and mobility concerns on this corridor have been reported by Metroplan since as early as 2002. The 2003 Central Arkansas Regional Transportation Study – Areawide Freeway Study and the 2012 Congestion Management Process Report also both included recommendations for capacity improvements within this corridor. Although this corridor has been a high priority for improvement for over a decade, an adequate funding package for this improvement could not be established under the Department’s standard federal-aid funding constraints. The CAP program has provided additional state funds that can be combined with federal-aid funding in order to create a unique funding scenario to address the pressing needs to maintain and improve this important part of the state’s transportation system. Due to the reality of limited highway funding, the Highway Commission has chosen to focus the majority of its federal aid program on system preservation projects which seek to improve the condition and operation of existing highways – especially those that carry a high percentage of the State’s traffic. By focusing these funds on system preservation, the Department will be able to reduce the funds needed to continue to maintain deteriorating highways and the higher cost of replacing failed highways and bridges. Although the primary purpose of the CAP program is not system preservation, the 30 Crossing project is an example of utilizing a combination of CAP and federal aid funds to complete a very critical system preservation project that improves one of the most important highway and bridge corridors in the state. By preserving this top priority corridor today, the Department will be able to focus future system preservation and maintenance funds on other high priority corridors. A review of the ARDOT estimate was performed using identified project risks and their probabilities as inputs to a risk-based cost-estimating simulation which provided a probabilistic range of estimated project costs. The estimate is being shown as a range which is typical for a complex major project at this stage of development. The review indicated a range of $615 million to $700 million. This project will initially be delivered using a fixed budget/variable scope design-build delivery contract. Design-Builders will compete to provide the most project scope for the fixed budget. In the event that none of the Design-Build firms are able to provide the full project scope, additional projects will be programmed to complete the project scope at a future date. Any work postponed to a future date will include additional costs for inflation.